JUNIOR miners are finding business across South Africa’s border easier to conduct than inside the country, especially in the coal sector which is not where you’d expect a start-up business to thrive considering the opposition of civil society to the fuel. Jacques Badenhorst, the recently appointed CEO of Maatla Resources, a company building the Mmamabula Colliery in Botswana, is an example. “The uncompetitive investment environment in South Africa and regulatory issues are not helping the industry,” he said at the Junior Indaba, a mining conference last month. “Junior miners are looking elsewhere such as Botswana which is an option in terms of supplying coal into South Africa,” he said. There’s also a unique opportunity for Botswanan coal: whereas previously the country struggled to supply export markets given its landlocked status, it now has a ready domestic market given Eskom’s call for more coal, some 33 million tonnes (Mt) in the short-term – a procurement drive described by Phumaphi Mashale, CEO of the UK’s Shumba Energy as “… an insane amount of coal”. Eskom is facing additional pressures given the increase in the export price of coal which has seen local players prefer that market over Eskom, which is trying to trim its primary energy cost. “By working with the South Africans, Botswana has got the ability to complement the supply to Eskom which can liberate a lot of companies here (in South Africa) to export coal,” said Mashale. Said Badenhorst: “It has certainly created an opportunity for Maatla in terms of a distance perspective to places like the Northern Cape and Western Cape markets, and there is definitely a big coal shortage. If you speak to any coal trader currently, nobody can get consistency of supply and good quality coal,” he added. And there’s also the point that Botswana is just an easier place to do business in the mining sector than in South Africa, according to Mashale. “There are a number of tax incentives that mean when you operate in Botswana, and there are no exchange controls. But apart from that, there is unlimited care for tax losses and you get a tax reduction on the yellow equipment that you bring into the country,” he said. Andre Bojé, CEO of Minergy which is developing the southern end of the Mmamabula coal fields in Botswana, said he had last seen coal markets like this in 2007, but added: “I’ve never seen the South African coal market stretched like this. 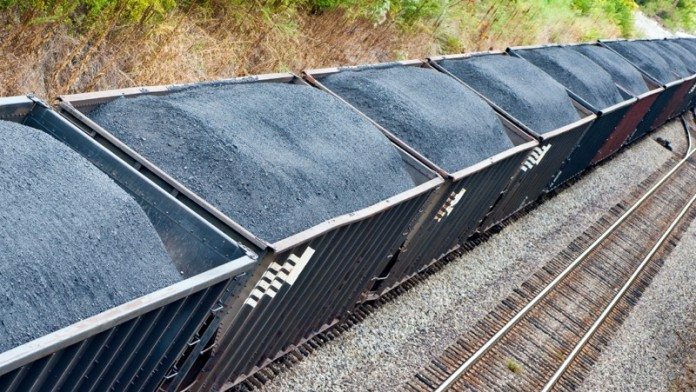 There are huge gaps to enter the South African market and such is the demand for coal at the moment that logistics is not a problem”. Bojé said the prospect of Transnet building a rail line will be a fillip for Botswana. “At the moment you can get about 2Mt/year out of Botswana but no more than that. We have had meetings with Transnet and they have prioritised the Lephalele line [into Botswana] so if that comes to pass we could have 5Mt/year or even 15Mt/year from Botswana in about three years’ time,” he said. Minergy is investigating building its Masama project with run-of-mine production set at some 2.4Mt/year of between 5,800kCal to 6,000kCal/kg quality coal. “I think we can produce saleable production of 1.2Mt/y,” said Bojé earlier this year. “We will start with that just to get the project off the ground, but the capacity of the plant will be about 4Mt/year,” he said. The project is 50km to 250km closer to the North West province and Cape markets than coal miners in Mpumalanga province.